Iranian leader Mahmoud Ahmadinejad has been accused of undermining Iran's dignity, in a live TV debate with his main rival 10 days ahead of elections. 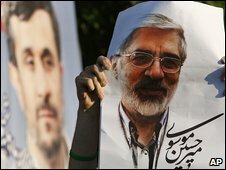 Former Prime Minister Mir Hossein Mousavi said Mr Ahmadinejad's firebrand style had caused problems for Iran. It is the first time an Iranian president has taken part in a televised election debate. The BBC's Jon Leyne, in Tehran, said it was a remarkable, no-holds-barred fight which will have amazed Iranians. 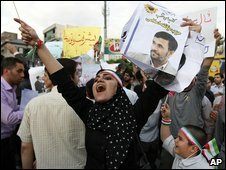 Mahmoud Ahmadinejad, began by accusing opponents of spreading lies about his government. Mr Mousavi responded by mocking Mr Ahmadinejad's foreign policy, which he said had undermined the dignity of Iran. He said Iran had been "downgraded" in the eyes of world by President Ahmadinejad's firebrand style and statements. He also criticised the government for repressing student protests. Mr Ahmadinejad countered by criticising Mr Mousavi's wife for campaigning on his behalf, and he accused her of not having the right qualifications for her post as a university professor. Our correspondent says it is hard to say which candidate won the debate, but it has brought the election alive. Before the debate, the Iranian president described the Holocaust as "a big deception" used by Israel to win support. His comments were described by French President Nicolas Sarkozy as "unacceptable and profoundly shocking". Mr Sarkozy also told Iranian Foreign Minister Manoucher Mottaki that Iran faces greater isolation if it refuses to negotiate over its nuclear programme. In earlier TV debates, ex-Revolutionary Guards chief Mohsen Rezai pledged to move away from state economic control and encourage the private sector. National Trust party leader Mehdi Karroubi countered that he would distribute the profits of oil earnings to every Iranian adult. Analysts say the sagging economy is considered Mr Ahmadinejad's most vulnerable area, four years after promising to boost Iran's financial fortunes and share oil wealth among the most impoverished sectors of society. In a campaign speech on Sunday, the president said he would use the debates to "present dossiers" on the past three governments, which include one led by Mr Mousavi. Mr Mousavi has campaigned on pledges to improve women's rights and end discrimination. Before the Karroubi-Rezai debate began, the moderator said criticism of the other two candidates would not be permitted as they were not present. Mohsen Rezai said he was seeking an economic revolution in Iran. "I intend to change the economy from a state-controlled one to one that sees significant private sector participation," he said. Mehdi Karroubi said he would distribute Iran's profits from oil production to everyone over the age of 18. He added that his focus would be on "employment generation and protecting citizens' rights". Mr Rezai promised that initially he would deal "in person.... with any infringements on citizens' rights... to make sure everyone understands the gravity of the situation". Iran's television channels are all state run with senior staff appointed by the Islamic revolution's Supreme Leader, Ayatollah Ali Khamenei, who has the final say on all matters of state.